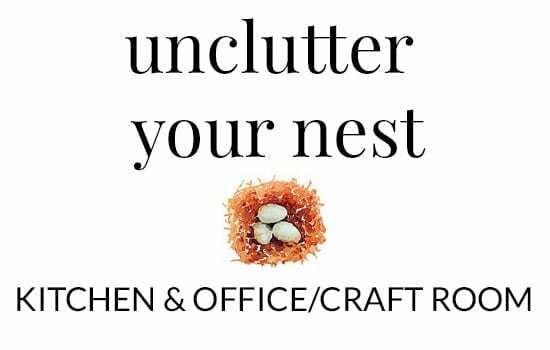 Home Decluttering Tips: Week Two of the Unclutter Your Nest Bootcamp finds us in the kitchen, office and craft room. We're going to use these tips and see how to declutter your home as we dive into these areas. Hello Decluttering compadres! So, how did you do last week? I hope you are having great success during this Unclutter Your Nest and Lighten Your Load Boot Camp. The 207 pounds of stuff that we took out of our home from our bedrooms and bathrooms has really energized and motivated us to keep at this declutter process. 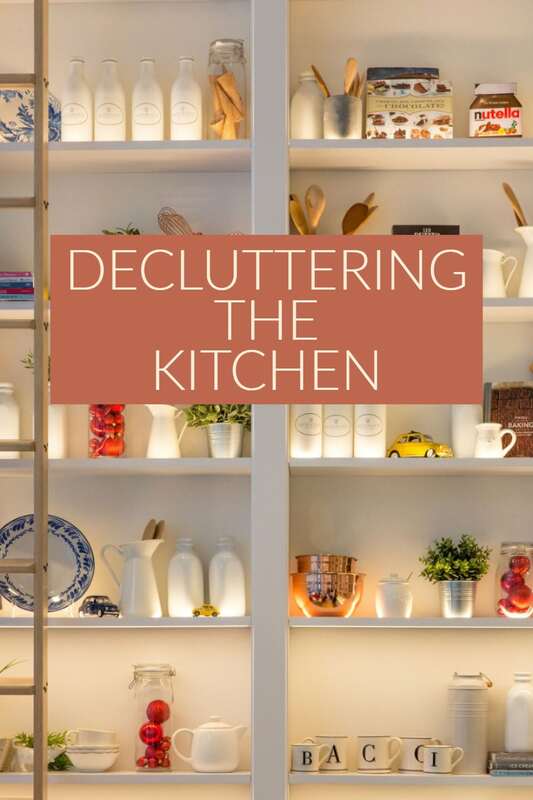 Now I'm chomping at the bit to get the decluttering going on in other areas of our home and share with you the home decluttering tips that have worked for us along the way. If you are just starting the process of how to declutter your home through our Unclutter Your Nest and Lighten Your Load Boot Camp, then pop back here to get your calendar and discard sheets. I’ve got to be honest, while weighing it is one more step to take, it has been so motivating. If you are a goal oriented person, seeing those numbers on your scale increase will surely motivate you to keep going. And if I’m at 95lbs, I promise I’ll find something that weighs 5 lbs to take it to 100. 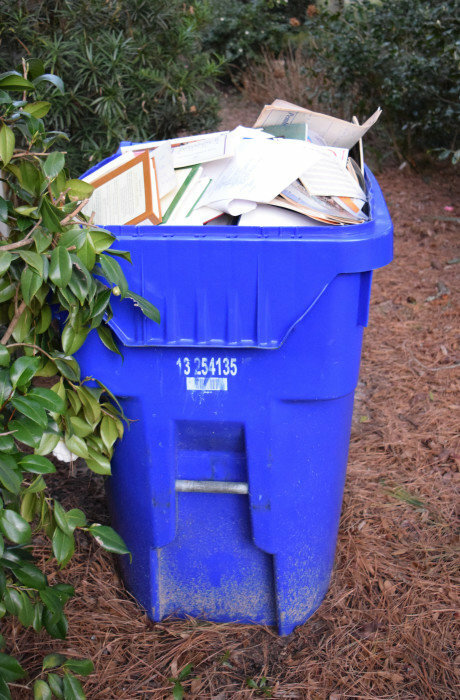 Oh, and I KNOW you are going to have many pounds of discards as we declutter your home…..check out this page for WHERE TO RECYCLE AND DONATE YOUR DISCARDS. During this process, it has occurred to me that I am attempting to lay hands on just about every item in my home. That’s quite an undertaking, but it’s been so invigorating to use these home decluttering tips to shed our home of unnecessary and unneeded stuff and it is reassuring to know exactly what is in my home. Bring a bag/box for TRASH, DONATE, RECYCLE, RELOCATE and, if you really need it, for STORAGE. Bring a dustbuster or vacuum, rags, and cleaning solution. Put on your favorite Pandora station, CD or radio station. You can deduct the clothes you donate on your taxes. The discard list can also help to keep track of that. Just estimate values of the items as you go along. If you are at all like me, the kitchen is a clutter gold mine. I am on record as being a sucker for kitchen gadgets. Maybe ‘sucker’ is too nice a word…the truth is that I think I have a kitchen gadget ‘problem’. My brief stint at Williams-Sonoma only enabled my ‘problem’. So that said, my first order of business when I began to declutter the kitchen was to really examine all my kitchen tools and to aside all my favorite kitchen gadgets and cookbooks to protect them from the tsunami of the unclutter machine!!! I RECYCLED all the storage items (jars, containers, etc…) without lids, as well as lids without jars or containers. Most everything else that was removed from my kitchen was DONATED. I picked up every single item in all of my kitchen drawers and some of my cabinets and laid them on the counter. I skipped the cabinets that housed my everyday dishes as I use them…everyday… and know exactly what is there. By laying everything out and picking everything up, I could easily see where I had duplicate items. I had 3 different versions of handheld lemon juicers; couldn't tell you why. Somehow our family of 4 had accumulated 17 ( yes, 17) travel mugs! I guess I was thinking that if we each had 4 hands, we'd have 1 spare in case one broke? Don't know. In any case, we picked out the best 6 and sent the other 11 to find good homes elsewhere. I had some items that I just never used and can’t imagine ever using. How many baking dishes does a family of 4 need? I had 4 of those white Corning casserole bakers, 3 of those clear Pyrex bakers, several Pampered Chef baking dishes as well as a couple other more decorative bakers. In laying them all out, I was easily able to realize which ones I use on a regular basis and which ones haven’t been out of the cabinet for years. And remember that ‘Christmas’ feeling you might get when you discover some long lost item? Well, I was reminded that I needed another shield for my KitchenAid Mixer to prevent the flour from flying out of the bowl because I had lost half of the one I had, probably when we moved 10 years ago. So in this decluttering process, I threw out the ½ of the shield that I still had and wrote down on my ‘gift ideas’ list that I needed a new shield. Well, when I went digging into cabinets later that day, you’ll never guess what I found? The missing half!! Luckily I hadn’t thrown out the trash containing the ½ I knew I had and so was thrilled to reunite these two pieces and happily removed it from my wish list. Christmas in January!? OK, so we've tackled our kitchens, let's take our home decluttering tips to our offices and craft rooms. When you think about how to declutter your home, these rooms are full of paper. Paper is one of those things that comes in so frequently and we don't know quite what to do with it, so we file it away. Because you need to lay your hands on every sheet of paper, the office takes a good amount of time. It may be that you put all the papers you need to go through in a box as you work through your office with the intent of ‘processing’ some of them this week and the rest over the next week or couple of weeks. Just make sure you stay on it. Once I'm done with this Boot Camp…I really want to move our home to be as paperless as possible. Through this process decluttering the office, we've recycled 315 pounds of paper that we just didn’t need to have because it was outdated or otherwise unnecessary. Let me say that again…315 pounds of paper!! Most of the 315 pounds of paper were professional documents from my husband's business, but we all hold on to documents in case we need them for taxes or other purposes. There are some statute of limitations after which you can safely discard your documents. Suze Orman has detailed what should be kept for how long here. We had tax documents and returns going 20 back years. We discarded 13 years worth of them. Because of the personal financial nature of these documents, we shredded or burned these documents. Love this shredder as it also shreds credit cards! We had canceled checks going back many years as well. We burned or shredded them. Non-sensitive papers were put in our recycle bin. I'm feeling for the trashmen when they come this week. Instruction Books and Manuals. I used to have 2 big binders of all the manuals & warranties of all the appliances in my home until I realized that these manuals were available online as PDFs. On my computer, I created a ‘Manuals and Warranties' file and then downloaded a PDF for each appliance and scanned the warranties and saved them to the ‘Manuals and Warranties' file. Scan all your old photos and save them to disk or flash drive/USB drive/thumb drive. Then, and here’s the hard part, recycle your photos. If you are like me I know this will cause you to panic a bit, but you have the digital versions now and can access them anytime. I made duplicate copies and put an extra set in our safe deposit box at the bank just in case. This will take some time and you may not get it all done this week, but if you plan to do a little bit a day, you can work through it. Once again, put them all in a box and spend an hour a day weeding through them. I have an HP Envy 7645 which is a printer/scanner/fax machine/copier and it works perfectly for this. I would imagine most machines with a scan capability would accomplish this task. I made a file for each year and saved each photo to the appropriate year. As an update to this…we just recently had to evacuate our home due to Hurricane Florence. When we were packing up, trying to figure out what we needed to take with us, I didn't even give my photos a second thought as I knew that we had the CDs with all our memories safely in our bank's safe deposit box. Scan your child's school documents that you might need or want later. I set up a file for each child on my computer and then saved all pertinent date to their file. Scan all your receipts. 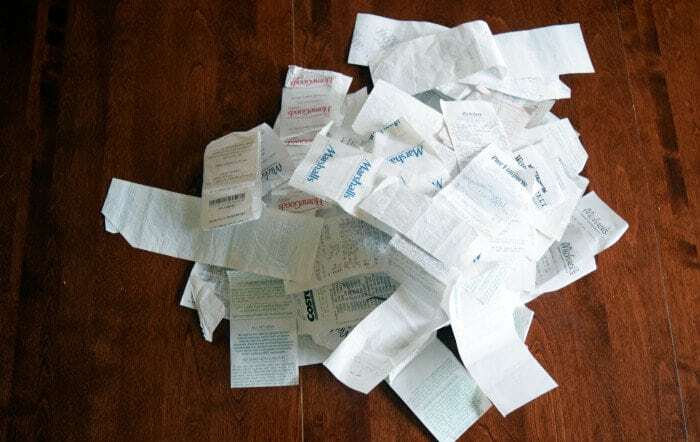 My goal for this year is to scan my receipts weekly and then trash them to eliminate that paper clutter. While my Pixma would have worked just fine, I got a Fujitsu ScanSnap for Christmas which is the BOMB. It makes scanning receipts, and other documents, so effortless that there really is no excuse for me to not do this on a regular basis. The software that comes with the scanner is well integrated such that when you scan a receipt or document, you are immediately prompted as to how and where you want to save the document/receipt. When we think about how to declutter the craft room, I would imagine most crafters have a drawer (or 2), a box (or 2), a cubby (or 2) or a bag (or 3) of ‘best-laid plans’ craft supplies. You know what I’m talking about..don't you? I hope you do. Please tell me you do. I once purchased ALL the fabric necessary to make a queen size quilt, although I had never ever quilted before. I had great plans, but they never got off the ground and that fabric found a home somewhere else along the way, though I don’t quite remember where. Scrapbooking Supplies: I also tried my hand at scrapbooking several years ago, but have rather fallen off lately. I packaged up all my unused scrapbook paper, pages and stickers, put them in a clear bag and sent them to Goodwill and to a friend of mine who teaches Kindergarten. Fabric and sewing supplies: I donated boxes and bags of fabric swatches, polyfil, trim and other sewing paraphernalia to our local high school for use in their sewing class. Our local library will always accept our unwanted books for their semi-annual book sale. I will be taking 151 pounds of books (or about 100) to my library tomorrow. 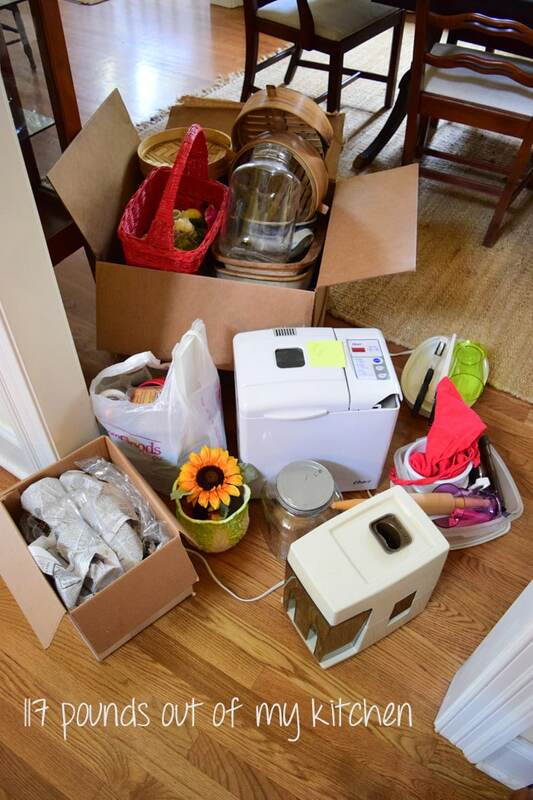 Our journey to discover how to declutter our home has thus far resulted in 808 pounds of stuff that has been taken out of our home (and I have 2 weeks to go!) Holy Cow! Bookmark these Home Decluttering Tips or pin the following image for your future reference. Interested in More Home Decluttering Tips & Organizing Posts? We're starting the second week of our Unclutter Your Nest and Lighten Your Load Boot Camp and decluttering home journey. Isn't your home breathing easier with X pounds of stuff taken out of it? Aren't you breathing easier just knowing that you have fewer things to tend? I'll be back next weekend with home decluttering tips and suggestions for your laundry room, den and linen/coat closet. Until then, enjoy your lighter home. Wow Lynn! You aren’t stopping! I’m impressed! The little box from your kitchen, with the baskets looks like fun, send it over!!! lol. My kitchen is way too small to be gathering gadgets and such. I have a crock pot…my best friend in the kitchen and a few others, but not many. Also, moving countries and continents made me get rid of a lot of clutter throughout the years already. But I did un clutter one of my kitchen cabinets on the weekend! I keep “stuff” in there and it was just bursting and everything just dumped in. So, that looks a lot better now! As for the office, I’m going to as well…soon. Thanks for the motivation friend, love to see you lightening your home! Have a great week! Good Morning sweet Katrin. If nothing, I’m getting more ruthless! Just finally really taking stock of what is actually in my home. You are right, moving frequently will make you lean and light. We’ve been in this home longer than I have lived in one place in my entire life (13 years) and I can see how so much stuff gets put away and forgotten. Not for long though. HI Katrin! I am very much feeling inspired by you! I live in a 3 bedroom townhouse which is about 1100 square feet. My son moved out shortly after he graduated College last spring. I found this to be perfect timing to declutter. Also, a friend from work daughter was getting married so I was able to give away a great deal of kitchen items. For example, I had 3 slowcookers. I don’t entertain so one slowcooker for me is plenty. Also, I am in agreement with you – decluttering should never stop. I subscribe to the rule one item in my house, one item out of my house. Infact, I keep items in my garage as sort of a staging area so when items come in, I don’t let them in the house UNTIL I find something to toss. Hi MaryBeth, These are wonderful ideas! I am with you on the ‘one in-one out’ rule…it’s the only way to go. And the suggestion about the Salvation Army collection is wonderful. So very glad to know of that. Thanks for sharing it. I’m inspired by how much you were able to get rid of. Craft supplies are the worst for me and I get analysis paralysis and subsequently give up. What are your thoughts about common areas or an area that I’ve designated as my “office/craft room” that also doubles as the family storage area. When you say ‘family storage area’ I’m thinking garage or storage room…is that right? If so, think that’s entirely doable. At the end of the day it’s just about having a place for everything, right? And if it is a storage room, can you relegate those longer term storage items such that your craft items are more easily accessed? And as it relates to analysis paralysis, I’d be lying if I said that there weren’t a few times when I say “rats, I wish I hadn’t gotten rid of …”…but it doesn’t happen often. And I then find myself figuring out ways to use what I still have. I can honestly say that I have not gone out and repurchased an item that I previously tossed. Good luck and feel free to reach back out for support…you can do it! Thank you for your reply. In 2 moves of my home, I’ve had to leave some boxes behind and had the “wish I still had that” but also have not gone out to purchase the items either. I should clarify my question on the shared space. 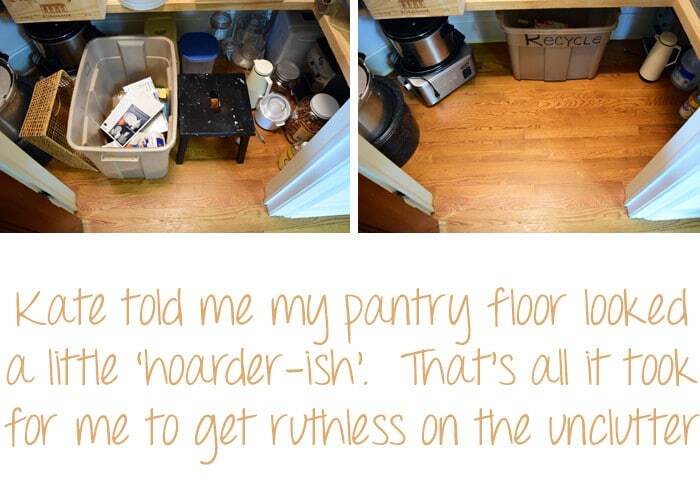 Do you purge shared spaces by yourself (kitchen, garage, etc), or do you have your significant other involved? I do not want there to be resentment if I throw something away, but if this task is not a priority for my significant other, then a shared space will not be completed. I see…yes, you do have a dilemma. Hmmm…I guess you could set down some parameters up front or remove those items in question to another spot and ask them to deal with them. Do they have a space that they could be moved to? You could also put all the stuff you aren’t sure about in a pile and ask for 1 hour of their time…put toss, recyle, donate, keep buckets out and ask them to make quick decisions about the stuff in the pile. Keep me posted, I’m curious how you deal with this. Lynn you are doing fantastic! ! The office craft room must have been quite a major undertaking. I don’t even want to start with all of the paperwork I have accumulated. I usually use old paper to start fires in my fireplace in the evening. So far I have taken down the ornaments from the tree and put almost everything away. I also got the girls to clean out their bathroom. This week I’m hoping to do both bathrooms again. Keep going and I’m be tagging along behind you. Come on Mary!! Isn’t it invigorating? I am anxious to go from room to room and see what I unearth! So glad you’re joining me in the fun. I’ve started a lot of purging of my clothes and kid books, but I really need to tackle our home office and the kid’s playroom. It can be intimidating at times. Thanks for the motivation. Wow, it’s a great idea to weigh the clutter before tossing it out. I am doing a similar Organized Home Challenge which i attempted last year too. I get stuck in the kitchen. I finished it but never did get through all the cookbooks and recipes! This is a great idea. I look forward to the rest of the series and hope you’ll link up with our Small Victories Sunday Linkup too! Hi Tanya…the weighing is so motivating. I will have a hard time not weighing my everyday trash after this month is over! ? I will definitely check out your challenge too. Fun to see how everyone else does it. Thanks for stopping by tonight and I will swing my Small Victories Sunday. Hi Mandi, I am a little late to the ‘anti-hoarder’ motto, but definitely moving there. Memories over stuff…right!? And fun stuff is going to happen in your craft room. I can’t imagine not having mine. Thanks for stopping by today from your home in north cackalacky from my home in southeast cackalacky! Hi Shasta, I’d say that staying clutter free is a good side of OCD! And I’m with you 100% as it relates to your kid’s toys. If they are like mine, they aren’t suffering from a lack of toys. My dad used to pick up the toys that were laying around, keep them in a box and when we realized we couldn’t find them, we’d have to do a chore to get them back. Made us a little more aware of keeping them put away! We’ve been working on this little by little. I should have my husband do our kitchen drawers – at the very least – this weekend. Those drawers hold so much junk! And the tip about scanning receipts is brilliant!! Especially for tax reasons. So much easier to keep up with! There is much to be said for working on the declutter little by little. I’m diving in head first for a couple of reasons, but have been flagging of late. I’m getting it done, but…lets’ just say I’ve been sleeping well at night!? Hugs to you and your family. Happy Sunday Coco, I tell you, it has been invigorating and motivating to get rid of so much stuff…and I still have to tackle the attic and garage! I’d love to see your dish pantry…I’m sure I’ll be able to find it on your site. I moved in with my mom in a two bedroom house with my child to take care of her while she was dying. She passed away 3 months ago and I feel I need to declutter and bring some of my stuff inside and out of storage but I feel uncertain of every decision. So many things of my moms and even my days. Any tips to help me function and make decisions? I am so sorry for what you’ve been through. I can only imagine how difficult it has been. I do think it’s important that you give yourself permission to do this at your own pace. Is it possible to transition some of your mom’s possessions that you aren’t sure you want to part with into the storage unit when you take your things out? Maybe letting them transition there will help you realize what you are ready to permanently part with. If you miss it when it’s in the storage unit, then you know you aren’t ready to really part with it yet. I would also say that everyone has their own time table, you need to listen to yours. Maybe try a little bit here and there, but take it at your own pace. Do keep me posted on your progress and I’ll keep you in my thoughts. The best tip I’ve learned about decluttering is to start with the easy stuff. Don’t start with your mom’s jewelry. Start with the tattered towels or the overflowing kitchen cabinets or the medicine cabinet. Also, be gentle with yourself- you ARE allowed to keep things. Maybe don’t keep all of your mother’s coats, but maybe keep the one that most reminds you of her. Or maybe keep the casserole dish you remember from your childhood, but donate the other 6. And finally, always remember that donating her stuff (clothes, etc.) will not make you forget her. It WILL, however, allow her legacy to pass on to new people who can truly use and need those items. Good luck and hugs. Haley, what a beautiful, supportive and caring message. Thanks so much for sharing your thoughts and support to Susan. I don’t know if you will read this but I had to sort through my Mother’s things after she died. I work full time and it pretty much took me 4 years to get it under control because there was so much. Each item is hard to properly assess after a death. I am lucky I had enough time to weigh all of my decisions. My house is mostly clutter free now. This experience has taught me to whittle down my own posessions. It will be my gift to those who clean out my estate. They will not have endless littke things to sort through if I can hold my resolve. I find I have less attachment to things than my Mother. Photographs and original art done by family members are my most prized possessions. I feel if it hangs on the wall (the paintings) or fits into a few small boxes (the photos) it stays. If it is shoved into a drawer or needs to be dusted on a shelf it may be rehomed. Every week I look for something I don’t need and get rid of it. What wonderful guidance. …especially your very last sentence. And I do agree that stuff that is jammed into rawers by definition doesn’t bring you joy…you don’t jam joy in your drawers…right? We are in the process of moving my parents to assisted living, so will be paring down their possessions very soon. And what a gift to your family that they will not have the burden of making hard decisions at a difficult time. Your insight is so appreciated. Thank you so much for sharing your experiences. Thank you so much for your journey. This is exactly what I need to do. Hi Cheryl, thanks so much for popping by and for leaving your kind comment. I’ve got to be honest, it was an exhausting month, but so worth it in the end. One year later and the areas that I worked on have remained mostly clutter free. Any clutter now is much easier to tackle as it hasn’t has as long to accumulate! I do hope I gave you a little encouragement and some valuable suggestions…that was my intent! Good Luck with your declutter! Hi Jen, I hope your health is improving my friend! But so smart of you to hire someone to help you as needed. Your suggestion about the photos is a very smart one. What I did was make 2 copies…1 I keep and home and the other I put in our safe deposit box at the bank. But even with that backup, it was gut wrenching to toss them. That being said…it’s been a year and everything I needed to find I have been able to locate on the disk. I hope you are enjoying a lovely weekend in your part of the world. Your post was a good inspiration. Working through a pre-move purge, as a combo of I don’t want to pay to move the stuff and I will probably be downsizing. I’ve lived in my current home for 14 years. Three years ago I did a first pass at purging. It was a valiant effort. Today, I mostly worked on the (3) bookshelves in my office and decommissioning a seventeen-year-old computer with (still) valuable stuff on it. Out went two full grocery bags of paper, two laundry baskets of (NWT or like new) donations, and about two shoe boxes of paper that are now properly interfiled in my tax folders (’cause I want to be prepared in case I get audited–it happens). I feel much better already. You go girl! That’s a ton of discards for just one day! I know it feels so good to walk in that room and see the results of your efforts. Just taking care of the computer is a huge undertaking. Well Done You! Even though I have done these declutters over the years, I’m getting ready to go back through with a fine tooth comb as we will be downsizing our home and, like you, I don’t want to pay to move/store anything I don’t absolutely love and/or need. Are you going back in today or taking a day off? Hey Jeni, I hate that some n’er do wells broke in your home! I’m a firm believer in karma and they’ll pay the price down the road. But you did make me go back to the post and re-read it and add that I also made a duplicate copy of all my photos and put those duplicate disks in our safe deposit box in the bank. I hadn’t considered someone stealing everything, but was concerned about a fire. In any event, having that spare copy gives me a bit of peace of mind. Thanks for chiming in and making me realize that I hadn’t included that critical piece of info. I’m also of the opinion that original photos shouldn’t be tossed. Getting things digital is wonderful, but you need to make sure that you are constantly updating your media to the latest versions. Years ago we had the option of having photos put to a 3 1/2″ floppy disk when getting film developed. I thought I was being so progressive. But now that media is out dated. Having no access to a floppy drive those photos would be otherwise lost to me. Digital formats do deteriorate, they don’t have a forever life span. If you are determined to have everything digital, invest in a cloud. Hi Kathi, that is certainly something to consider and thanks for chiming in. For what it’s worth, I have been successful transferring data and photos that were on those 3.5″ floppies to CDs and DVDs…and really quite reasonably too. There are many resources, both online and I would imagine locally. I was able to do it locally. But at the end of the day, the last thing you want is to be uncomfortable and worry about not being able to access your data. A couple of options: (1) when I got divorced and had the need to cleanse, this is what I did. Our trash pick-up day was Wednesday, so on that day every week before going to work, I’d take a walk to the basement or whatever and put out one or a few things that weren’t needed. It took a little longer but it worked and the task wasn’t overwhelming. (I stayed in the marital home). (2) Recently I moved from and 8 room furnished house to my boyfriend’s 6 room house that was already furnished. I had to get rid of a lot of stuff. I hired an organizer to help me, she was wonderful. She arranged pick-up of the material being eliminated and donated most to my choice of charity (Hospice). She also arranged receipts from Hospice for same. Well worth the $$$ spent for the organizer. I picked up many tips from her and could do it now without her if the need be. Hey Noreen…both really great ideas. I’ve often thought of hiring an organizer…hmmm…may just have to do that. Especially with a downsize/move in our near future, it might really be useful to have an impartial/objective eye help me downsize. Thanks for popping by and for sharing your input. Hi Lynn. Great info and tips. I have a question. I have tons of paper I need to get rid of. Some can’t be recycled. You mentioned you burned some. How did you burn them. I don’t know how to do that. Could you tell me how in detail or where you could do it. Thanks. Hi Edith, thanks for stopping by and popping in with a question. When we did our unclutter it was in January, so we just tossed those ‘sensitive’ items that we didn’t want floating around in the trash bin into our fireplace. Because we had so many, it took a little time…we couldn’t dump them all at once or it would’ve smothered the fire. If a fireplace isn’t a great option and you don’t have a shredder handy, Staples offers shredding services. I know that in my area there are also several businesses whose sole function is the shredding of documents. I hope this helps! Pop back and let me know what you end up doing. I’m sure you are not the only person with this question. I missed your 1st installment and I don’t know where to get the rest . I would love some help. I have to declutter and I’m starting tomorrow . So please help me. I will be glad to share the other posts with you! There’s a ton of information in them for you and I so hope it helps you get what you want/need to get done. At the end of the day…you just need to dive in. Good luck my friend…keep me posted with your progress. Just found this through Pinterest and I love it for a few reasons. One it helped me know I had done the right thing by letting some of the thing go that I had and two its a motivation to keep me going. Plus it helps that I took away some great ideas on paper clutter, thanks. I do have to admit though that I just about had a stroke when I read your suggestion on discarding pictures after you had scanned them. I am however glad you recommended a backup in case one fails. I have thousands of printed pictures from pre-digital days, some dating back to 1800’s but I couldn’t ever consider getting rid of any of them. I have digitized them but there is something about looking at actual printed pictures that I love but I know that’s not for everyone. This is how I sorted my printed photographs. I took them a package or box at a time & any blurry, landmarks, animals and such I trashed unless it was of some importance and there wasn’t another one like it that was clear. Duplicates I put in a box & offered them up free to take at our next family reunion. I used some card stock paper I had & cut it down to size & made dividers with years marked on them to separate the pictures as I went through them. I used the shoe box photo boxes to store them and anything larger than a 3×5 I got a few 12×12 plastic boxes for those. It took me a few years to complete but when I was finished they were in order by year, only the best ones remained and the duplicates had a new home for others to cherish. Hello my friend. I am so glad you were able to get some useful bits out of this post. I promise you that it took me a while to actually toss the pictures out…but…2 years later, I have still been able to access every picture I need. But I completely get that it’s not for everyone. And your idea for sharing all your discards is brilliant!! I know your family was thrilled and thankful. Thank you so much for stopping by and sharing your idea with everyone. It is very much appreciated. Wishing you a beautiful and clutter free day my friend. Decluttering areas like kitchens where missing parts MIGHT turn up, I keep an extra box for ‘trash unless the rest appears’ so I don’t have to go digging through everything else if the rest of the whatever surfaces. Depending on what you’re dealing with, going through that box can be a good job for kids, too. Every once in a while we pull out all of our Tupperware-type containers from where they live and someone (usually the 13 year old) matches everything up and pulls out anything damaged. The good stuff goes back, the rejects are reviewed to make sure there’s nothing leaving we actually do need a new one of (very small containers are so useful but so prone to damage or missing lids) to add to the shopping list or that is perfect for a new job elsewhere (we have one ~1 cup lidless container per car as an on-the-go dog bowl, works just fine and not the end of the world if something happens to it) and the rest gets disposed of. Less frequently before stuff gets put back we review to make sure we don’t have an excess of one size or another, which happens when you get stuff as sets. Extras that are in good shape either get put to be donated, or if it’s close to a major food holiday, set aside specially for sending people home with leftovers in something they don’t need to return. I especially like the idea of keeping spare containers around the holidays for leftovers! Takes the burden off of the recipient in having to return the container afterwards! And love the idea about keeping a lidless bowl in your car for your pup! Gonna steal that idea for sure. Like you, I do go through my storage containers once a year and match lids with bowls…and yes…a great job for a kiddo.! And finally, setting aside a box for ‘Might turn up’ is brilliant as well! Thanks so much for sharing all your decluttering ideas! They are very much appreciated by me and the rest of the readers…crowdsourcing of ideas is the way to go. I haven’t read all the earlier comments so my own may be repetitive. Be sure that all your scanned documents and photographs are safely backed up. Computers have an ugly way of giving up the ghost and making every thing you’ve saved inaccessible. I use Passport for Mac. It automatically does periodic full backups and incremental backups when anything changes. It has saved my files and my sanity more than once. Good tip Mandy and I will be sure to share this with the rest of our readers. I made several DVD copies with the photos on them and actually have them stored in my safe deposit box in the bank. Like you, I tried to think of all the worst ‘what if’ scenarios. Thanks so much for sharing your tip, I love crowdsourcing ideas. Breathe easy about trashing your photos. Old color photos aren’t archival and will eventually be ruined anyway. And even newer digitally printed photos are only archival when printed on quality inks and papers. Not the kind you get from shutterfly. So digitizing them is the best thing to do anyway! Also, don’t rely on a CD to save them, that is poor quality. I would put them on 2 separate cloud drives that allow full res copies and you can transfer to USB drives as needed. So true Alex! I haven’t put them on the cloud yet…but that’s a great idea. I have mine on CDs…one copy in my home and one in our safe deposit box. Hae a great day my friend. My purging is an ongoing process, some areas better than others! Today ( before I read this), I cleaned out one bookcase in office. Those items behind closed cabinet doors are a haven for “stuff” one doesn’t want to deal with! Today it got dealt with! A nice pile of photo paper, address labels, an old digital camera with the printer docking station! We’ve not used this camera in forever! I’ll but a new battery for it fir when it gets donated they’ll know it works. I’ve found a Hospice thrift store and take all my donations there to benefit them. Also found file folders with manuals in there, furniture receipt folder.. why I put them there, who knows! Shredded stuff, recycle stuff. I did a mini purge in garage on Friday, a load to dump and a load to thrift store. Every small task is a good feeling! Oh Alaine (what a beautiful name! ), I feel your pain! But don’t you feel good after disposing of all that stuff and finding new homes for it! I am going to see if our local Hospice has a thrift store! What a lovely cause. I am at the point where I think I need to do another purge. My youngest heads to college this fall, so think that will be a good time to really delve into what is in our home! Keep at it my friend! This was a good read! The craft room can be tricky since there tends to be some collecting that happens, but age and use is a good indicator if its time for a material to go. Thanks Vanessa…it is tough as we accumulate the necessary tools for our trades, but you are right…if you haven’t touched it in some time…maybe it’s time for it to find a new home. This article inspired me to clean my bedroom top to bottom and my daughters bedroom this week. Lets just say this house is a lot less stuff… My daughters room I got ride of 4 boxes of toys, clothes and books. my room I got rid of two garbage bags of clothes and a lot of accumulated stuff I never will use. Thanks for inspiring me to get this done I feel so much lighter now. I am so glad! And I know how good that feels! Truly, doesn’t it feel like you can breathe easier? With my youngest just heading off to college this past week, I am in another declutter mode as well. Thanks so much for sharing your success! Do you have any more rooms you are planning to tackle?